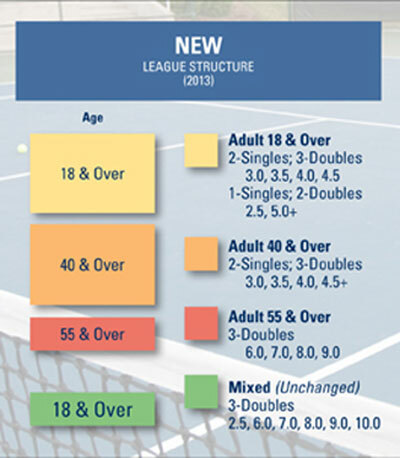 The USTA has changed the structure and format for the 2013 League Season for District, Sectional and National Championships. This graphic shows the programs available in Wyoming for 2013. In addition to the programs listed below, the USTA WY District will also be offering ITA Fall Mixed Doubles, and two (2) new league programs -- SUPER GRAND PRIX (for players 60+) and Adult League Tri-Level PlayDays (why should kids have all the FUN). To see the 2013 USTA WY League Schedule CLICK HERE. Contact Dave Boon (USTA WY ED) if you have any questions or to learn what innovative and FUN league events we can bring to your area. Adult Leagues are for men and women 18 years of age or older, with championship layers, culminating in a National Championship. NTRP levels include 2.5, 3.0, 3.5, 4.0, 4.5, and 5.0 divisions. Team match format is two singles matches and three doubles matches. 2.5 and 5.0 divisions play one singles match and two doubles matches. Adult Leagues are for men and women 18 years of age or older, with championship layers, culminating in a National Championship. Adult 18 & Over - NTRP levels for 18 & Over League Type are 2.5, 3.0, 3.5, 4.0, 4.5, and 5.0+. Adult 40 & Over - NTRP Levels for 40 & Over League Type are 3.0, 3.5, 4.0 and 4.5+. Team match format for both Adult 18+ and 40+ are two singles matches and three doubles matches. NTRP levels of 2.5 and 5.0 NTRP play one singles match and two doubles matches. Adult 55 & Over - NTRP Levels for 55 & Over League Type are 6.0, 7.0, 8.0 and 9.0 * (see below). Team match format for 55 & Over League Type is three doubles matches. Senior Leagues are for men and women 50 years of age or older, with championship layers, culminating in a National Championship. Team match format is three doubles matches. NTRP levels include 3.0, 3.5, 4.0 and 4.5. Super Senior Leagues are for men and women 60 years of age or older with championship layers, culminating in a National Championship. Team match format is three doubles matches. NTRP levels are 6.0, 7.0, 8.0 and 9.0 * (see below).